Methylphenidate (MPH) is a prescription stimulant commonly used to treat Attention-deficit hyperactivity disorder, or ADHD. It is also one of the primary drugs used to treat the daytime drowsiness symptoms of narcolepsy and chronic fatigue syndrome. The drug is seeing early use to treat cancer-related fatigue . Brand names of drugs that contain methylphenidate include Ritalin (Ritalina, Rilatine, Ritalin LA (Long Acting)), Attenta, Concerta (a sustained release tablet), Metadate, Methylin, Penid, and Rubifen. Focalin is a preparation containing only dextro-methylphenidate, rather than the usual racemic dextro- and levo-methylphenidate mixture of other formulations. A newer way of taking methylphenidate is by using a transdermal patch (under the brand name Daytrana), similar to those used for hormone replacement therapy and nicotine release. Ball-and-stick models of the dextro (on the left) and levo (on the right) enantiomers of methylphenidate, based on the crystal structure of (-)-threo-methylphenidate hydrochloride.Ritalin contains both dextro- and levo- methylphenidate isomers. The dextromethylphenidate is considered the stronger of the two isomers, responsible for most of the positive effects of the drug. Methylphenidate was patented in 1954 by the Ciba pharmaceutical company (one of the predecessors of Novartis) and was initially prescribed as a treatment for depression, chronic fatigue, and narcolepsy, among other ailments. Beginning in the 1960s, it was used to treat children with ADHD, known at the time as hyperactivity or minimal brain dysfunction (MBD). Today methylphenidate is the medication most commonly prescribed to treat ADHD around the world. Production and prescription of methylphenidate rose significantly in the 1990s, especially in the United States, as the ADHD diagnosis came to be better understood and more generally accepted within the medical and mental health communities. Most brand-name Ritalin is produced in the United States, although methylphenidate is also produced in Mexico, Argentina and Pakistan by respective contract pharmaceutical manufacturers and is most commonly marketed under the brand name "Ritalin" for Novartis. In the United States, various generic forms of methylphenidate are also produced by several pharmaceutical companies (such as Methylin, etc. ), and Ritalin is also sold in the United Kingdom, Germany, and other European countries (although in much lower volumes than in the United States). These generic versions of methylphenidate tend to outsell brand-name "Ritalin" four-to-one. In Belgium the product is sold under the name "Rilatine" for Novartis. Another medicine is Concerta, a once-daily extended release form of methylphenidate, which was approved in April 2000. Studies have demonstrated that long-acting methylphenidate preparations such as Concerta are just as effective, if not more effective, than IR (instant release) formulas. Time-release medications are also harder to misuse. In April 2006, the FDA approved a transdermal patch for the treatment of ADHD, called Daytrana. The once-daily patch administers methylphenidate in doses of 10, 15, 20, or 30mg. The patch must be applied 30 minutes to an hour before the effect is desired, but upon removal the drug does not continue to have an effect, allowing the user to come off the drug sooner. In cases with children this was especially beneficial during the time when they needed to fall asleep. Methylphenidate is a central nervous system (CNS) stimulant, reducing impulsive behavior, and facilitating concentration on work and other tasks. Adults who have ADHD often report that methylphenidate increases their ability to focus on tasks and organize their lives. Methylphenidate has been found to have a lower incidence of side effects than dextroamphetamine, a less commonly prescribed medication. When prescribed at the correct dosage, methylphenidate is usually well tolerated by patients. A 2006 review assessing the safety of methylphenidate on the developing brain found that in animals with psychomotor impairments, structural and functional parameters of the dopamine system were improved with treatment. This indicates that in subjects with ADHD, methylphenidate treatment may positively support brain development. 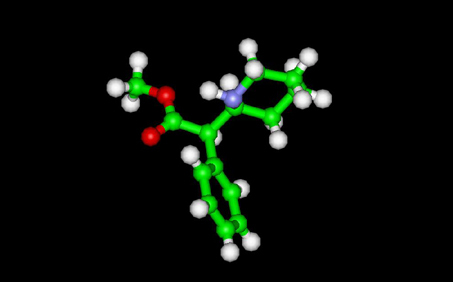 Methylphenidate has binding affinity for both the dopamine transporter and norepinephrine transporter, with the D-isomer displaying a prominent affinity for the latter. Both the dextro- and levorotary isomers displayed receptor affinity for the serotonergic 5HT1A and 5HT2B subtypes, though direct binding to the serotonin transporter was not observed. The isomeric profiles and relative usefulness of dextro- and levo-methylphenidate is analogous to what is found in amphetamine, where dextro-amphetamine is considered to have a more beneficial effect than levo-amphetamine. The means by which methylphenidate helps people with ADHD are not well understood. Some researchers have theorized that ADHD is caused by a dopamine imbalance in the brains of those affected. Methylphenidate is a dopamine reuptake inhibitor, which means that it increases the level of the dopamine neurotransmitter in the brain by partially blocking the transporters that remove it from the synapses. An alternate explanation which has been explored is that the methylphenidate affects the action of serotonin in the brain. Reported side effects include psychosis (abnormal thinking or hallucinations), difficulty sleeping, stomach aches, diarrhea, headaches, lack of hunger (leading to weight loss) and dry mouth, in some cases also including death. Less common side effects include palpitations, high blood pressure and pulse changes. Researchers have also looked into the role of methylphenidate in affecting stature, with some studies finding slight decreases in height acceleration. Other studies indicate height may normalize by adolescence. In a 2005 study, only "minimal effects on growth in height and weight were observed" after 2 years of treatment. "No clinically significant effects on vital signs or laboratory test parameters were observed." A 2003 study tested the effects of d-methylphenidate (Focalin), l-methylphenidate, and d, l-methylphenidate (Ritalin) on mice to search for any carcinogenic effects. The researchers found that all three compounds were non-genotoxic and non-clastogenic; d-MPH, d, l-MPH, and l-MPH did not cause mutations or chromosomal aberrations. They concluded that none of the compounds present a carcinogenic risk to humans.
] In response to the El-Zein study published in 2005, a team of six scientists from the Department of Child and Adolescent Psychiatry and Psychotherapy and the Department of Toxicology, University of Würzburg, Würzburg, Germany began a more in-depth study. They sought to respond to the challenge noted above to attempt to replicate the results of El-Zein et al. in a larger study. Their paper was completed in 2006 and published in 2007 in Environmental Health Perspectives (EHP), the peer-reviewed journal of the United States' National Institute of Environmental Health Sciences. This study used a larger cohort and a longer period of follow-up and included a small group of long-term users, but otherwise used what researchers believed to be an identical methodology to that used by El-Zein et al. (They note that El-Zein et al. published a short study report and did not publish detailed descriptions of methodology.) After follow-ups at six months, the researchers found no evidence that methylphenidate might cause cancer, stating "the concern regarding a potential increase in the risk of developing cancer later in life after long-term MPH treatment is not supported". The effects of long-term methylphenidate treatment on the developing brains of children with ADHD is the subject of study and debate. Although the safety profile of short-term methylphenidate therapy in clinical trials has been well established, repeated use of psychostimulants such as methylphenidate is less clear. In the United States, methylphenidate is classified as a Schedule II controlled substance, the designation used for substances that have a recognized medical value but present a high potential for abuse because of their addictive potential. Internationally, methylphenidate is a Schedule II drug under the Convention on Psychotropic Substances. Methylphenidate has been used illegally by students for whom the drug has not been prescribed, to assist with coursework and examinations. The use of ADHD medication in children under the age of 6 has not been studied. ADHD symptoms include hyperactivity and difficulty holding still and following directions; these are also characteristics of a typical child under the age of 6. For this reason it may be more difficult to diagnose young children, and caution should be used with this age group. On March 22, 2006 the FDA Pediatric Advisory Committee decided that medications using Methlphenidate ingredients do not need black box warnings about their risks, noting that "for normal children, these drugs do not appear to pose an obvious cardiovascular risk." Previously, 19 possible cases had been reported of Cardiac arrest linked to children taking methylphenidateand the Drug Safety and Risk Management Advisory Committee to the FDA recommend a "black-box" warning in 2006 for stimulant drugs used to treat attention deficit/hyperactivity disorder. Methylphenidate - Oral (Ritalin) side effects, medical uses and drug interactions. Retrieved on 2007-11-02. Ritalin (methylphenidate) Side Effects and Abuse. Retrieved on 2007-11-02. News from DEA, Congressional Testimony, 05/16/00. Retrieved on 2007-11-02. Steele, M., et al. (2006). "A randomized, controlled effectiveness trial of OROS-methylphenidate compared to usual care with immediate-release methylphenidate in Attention Deficit-Hyperactivity DisorderPDF (293 KiB)". Can J Clin Pharmacol. 2006 Winter;13(1):e50-62. Pelham, W.E., et al. (2001). "Once-a-day Concerta methylphenidate versus three-times-daily methylphenidate in laboratory and natural settings". Pediatrics. 2001 Jun;107(6):E105. Keating, G.M., McClellan, K., Jarvis, B. (2001). "Methylphenidate (OROS formulation)". CNS Drugs. 2001;15(6):495-500; discussion 501-3. Hoare, P., et al. (2005). "12-month efficacy and safety of OROSÂ® methylphenidate in children and adolescents with attention-deficit/hyperactivity disorder switched from MPHPDF". Eur Child Adolesc Psychiatry. 2005 Sep;14(6):305-9. Peck, P. (2006, 7 April). FDA Approves Daytrana Transdermal Patch for ADHD. MedPage today. Retrieved April 7, 2006, from http://www.medpagetoday.com/ProductAlert/Prescriptions/tb/3027. Fone KC; Nutt DJ. (Feb 2005). "Stimulants: use and abuse in the treatment of attention deficit hyperactivity disorder.". Current opinion in pharmacology. 5 (1): 87-93. PMID 15661631. Sharma RP; Javaid JI, Pandey GN, Easton M, Davis JM. (Apr 1990). "Pharmacological effects of methylphenidate on plasma homovanillic acid and growth hormone.". Psychiatry research. 32 (1): 9-17. PMID 2190251. Shults T; Kownacki AA, Woods WE, Valentine R, Dougherty J, Tobin T. (May 1981). "Pharmacokinetics and behavioral effects of methylphenidate in Thoroughbred horses.". American journal of veterinary research. 42 (5): 722-6. PMID 7258793. Barbaresi, W.J., et al. (2006). "Long-Term Stimulant Medication Treatment of Attention-Deficit/Hyperactivity Disorder: Results from a Population-Based Study". J Dev Behav Pediatr. 2006 Feb;27(1):1-10. Grund T., et al. "Influence of methylphenidate on brain development - an update of recent animal experiments", Behav Brain Funct. 2006 Jan 10;2:2. Markowitz JS "et al." (2006). "A Comprehensive In Vitro Screening of d-, l-, and dl-threo-Methylphenidate: An Exploratory Study". "J Child Adolesc Psychopharmacol". 2006 Dec;16(6):687-98. Volkow N., et al. (1998). "Dopamine Transporter Occupancies in the Human Brain Induced by Therapeutic Doses of Oral Methylphenidate". Am J Psychiatry 155:1325-1331, October 1998. Gainetdinov, Raul R.; Caron, Marc G. (March 2001). "Genetics of Childhood Disorders: XXIV. ADHD, Part 8: Hyperdopaminergic Mice as an Animal Model of ADHD". Journal of the American Academy of Child & Adolescent Psychiatry 40 (3): 380-382. Retrieved on 2006-11-11. Rao J.K., Julius J.R., Breen T.J., Blethen S.L. (1996). "Response to growth hormone in attention deficit hyperactivity disorder: effects of methylphenidate and pemoline therapy". Pediatrics. 1998 Aug;102 (2 Pt 3):497-500. Spencer, T.J., et al. (1996). "Growth deficits in ADHD children revisited: evidence for disorder-associated growth delays?". J Am Acad Child Adolesc Psychiatry. 1996 Nov;35(11):1460-9. Klein R.G. & Mannuzza S. (1988). "Hyperactive boys almost grown up. III. Methylphenidate effects on ultimate height". Arch Gen Psychiatry. 1988 Dec;45(12):1131-4. Wilens, T., et al. (2005). ADHD treatment with once-daily OROS methylphenidate: final results from a long-term open-label study". J Am Acad Child Adolesc Psychiatry. 2005 Oct;44(10):1015-23. Teo, S.K., et al. (2003). "D-Methylphenidate is non-genotoxic in vitro and in vivo assays". Mutat Res. 2003 May 9;537(1):67-79. El-Zein R.A., et al. (2005). "Cytogenetic effects in children treated with methylphenidate". Cancer Lett. 2005 Dec 18;230(2):284-91. (June 2007) "Does Methylphenidate Cause a Cytogenetic Effect in Children with Attention Deficit Hyperactivity Disorder?". Environmental Health Perspectives 115 (6): 936â€“940. "Swedish doctors "wrote illegal ADHD prescriptions"", 5 February 2005. Retrieved on 2007-03-11. "Although Ritalin has certainly proved that it is effective in many cases and helps children who suffer from ADHD to lead a relatively normal life, the long term effects on young developing brains is still largely unknown." Neil Osterweil. "Ritalin May Alter Chemistry of Young Brains", July 20 2007. "'We're concerned about longer-term use. It's unclear from this study whether Ritalin might leave more lasting changes, especially if treatment were to continue for years. In that case,,mjnjhnln it is possible that chronic use of the drug would alter brain chemistry and behavior well into adulthood.'" Pittsburgh Tribune-Review. "More students abusing hyperactivity drugs". Minutes of the FDA Pediatric Advisory Committee. March 22, . Slate Is Ritalin "Chemically Similar" to Cocaine? Lakhan SE; Hagger-Johnson G. The impact of prescribed psychotropics on youth. Clinical Practice and Epidemiology in Mental Health 2007;3(21). http://www.erowid.org/ Online library of psychoactive plants, chemicals and related topics. http://www.dancesafe.org/ A community-driver project from the rave culture gives non-judgmental information considered "youth-friendly" and well-informed. DanceSafe has pioneered many harm-reduction campaigns. Ritalin Helps Doctor Beat His Cancer-Related Fatigue, 2002/06/13, from Cancer.org "Writing in the medical journal The Oncologist (Vol.7: 96), Robert Wharton MD, a pediatrician, described his battle with cancer and the overwhelming fatigue he experienced."